Join us for the Spring Edition of the Northampton Cheese Walk Sunday April 28th from 4-6PM! There will be eight participating venues across town, each with a special cheese and drink pairing. They include Belly of the Beast, Bistro Les Gras, ConVino, Homestead, Provisions, The Dirty Truth, The Green Room, and The Sierra Grille! 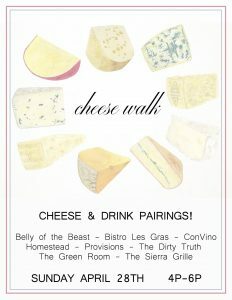 Enjoy the stroll around town complimented by our best cheese, beer, wine, and cocktails!